Dorian Mintzer, owner of RevolutionizeRetirement.com, a retirement coaching firm, and Amazon best-selling author of The Couple's Retirement Puzzle, was recently featured as a retirement expert on an episode of the Today show as a part of Al Roker's sixtieth birthday celebration. In the segment, Celebrating 60: Not Your Typical Retirement Plan, Al Roker said that despite being 60, he had no plans to retire, unlike his father, who retired at 55 because he hated his job. 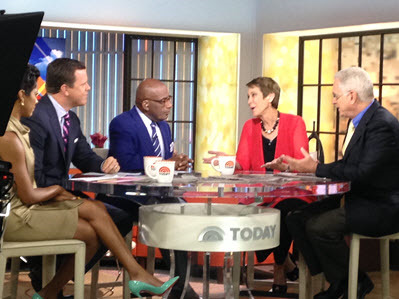 "If you enjoy what you do and you can physically do it," Roker adds, "why would I retire?" Roker noted that according to Gallup, most retired Americans stop working at age 62, and then asked Mintzer, "What if you don't want to go?" Mintzer replied, "Many more people are redefining retirement…people don't want to retire from life. Now people are thinking, 'How do I want to live my life so that it's fulfilling?' People come to a retirement coach because they're beginning to think about what's next in terms of connection, engagement, purpose, and meaning, and wonder, 'How do I open to possibilities? How do I work in a different way? How do I live a fulfilling life?'"